As Operation Brother’s Keeper continues, officials say that some progress has been made in the search for kidnapped students. The IDF’s Operation Brother’s Keeper, which was launched following the kidnapping of three Israeli teenagers, will enter its eighth day on Friday morning. Officials in the defense establishment said Thursday night that although there has been some progress, the operation is ongoing and it will take some time before the kidnappers and the hostages are located. The officials said that it is estimated that the hostages are in the Hevron area, so most of the operation is taking part in that area. However, they stressed, forces are operating in all parts of Judea and Samaria in an attempt to reach the kidnappers. It is believed that the operation will take between a few days and a few weeks, the officials indicated. So far, more than 300 Palestinian Arabs, most of them members of Hamas, have been arrested as part of the operation, including 53 of the terrorists released in the Shalit deal who were rearrested. 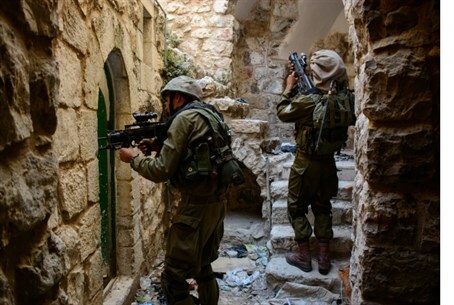 As part of the operation to destroy Hamas's terror infrastructure in Judea and Samaria, the IDF raided the offices of Hamas’s Al-Aqsa radio in Ramallah and in Hevron. In a statement on Thursday, Prime Minister Binyamin Netanyahu said that although the three teens kidnapped by Hamas terrorists last week have yet to be found, Israel is closer to discovering their whereabouts. “Our first and most important task is to bring the boys home safely,” Netanyahu said at the IDF Judea Command Center. “All Israelis are united in their support of our efforts, and we will not shirk our duties. Security forces are working around the clock to find them, both in the intelligence area and in the field. In addition, Netanyahu said, “we have been striking at Hamas, the kidnappers of the youths. Our troops are arresting Hamas terrorists in the field, and are closing down Hamas institutions and confiscating their assets." "We have rearrested more than 50 terrorists released in the deal to liberate Gilad Shalit. This is an important message to Hamas and all those who seek to do us harm: Hamas terrorists who have threatened to kidnap Israelis have themselves been arrested. I expect Palestinian Authority Chairman Mahmoud Abbas to remove Hamas from his government," added Netanyahu.